For the past 45 years, it has been the mission of Leviathan Jewish Journal to inform UCSC on issues, themes, and stories relating to the Jewish world. For the past five quarters that I have been a part of the journal, it has been a place to practice journalism and share ideas. However, it has also been a place where a single question has been lingering in my mind: Why was Leviathan chosen to be the name of our journal? In order for me to find answers, I would have to go back to the beginning of Leviathan’s history and track down the alumni of the first class of Leviathan from 1972. My search began when my Editor-in-Chief informed me that Bruce Thompson, a professor at UCSC who specializes in Jewish studies and is the current faculty advisor for Leviathan Jewish Journal, might know the founding members of Leviathan. After getting into contact with Bruce, he informed me that he did not know the founders, but he did know members of the immediate succeeding class. 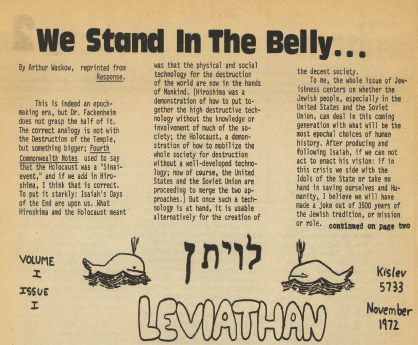 This led me to getting into contact with a gentleman named Ron Feldman, an alumni of Leviathan, who informed me of an article titled “We Stand in the Belly” written by Arthur Waskow in 1972 for the first issue of Leviathan. I was told that this article might give me some clue as to how and why Leviathan Jewish Journal got its name. After combing through Leviathan’s archives, I was finally able to find the article and read it for myself. In the article, Waskow refers to the story of Jonah, a Jewish prophet who appears in the Hebrew Bible, when he says, “Jonah was commanded to preach the destruction of Nineveh, that great city. He refused, again and again; but finally, gave in, and the city repented, changed its society, and was saved.” The story of Jonah says that Jonah received a vision from G-d that he was to go to the city of Nineveh and to preach to them that they must change the ways of their society. Jonah initially refused due to Nineveh being a far away and dangerous place, so he attempted to flee from his task by sailing away on a ship. During his attempted escape, Jonah’s voyage was impeded by a huge storm. In order to attempt to save the ship, the sailors onboard threw Jonah overboard. Jonah was subsequently swallowed by a giant fish. 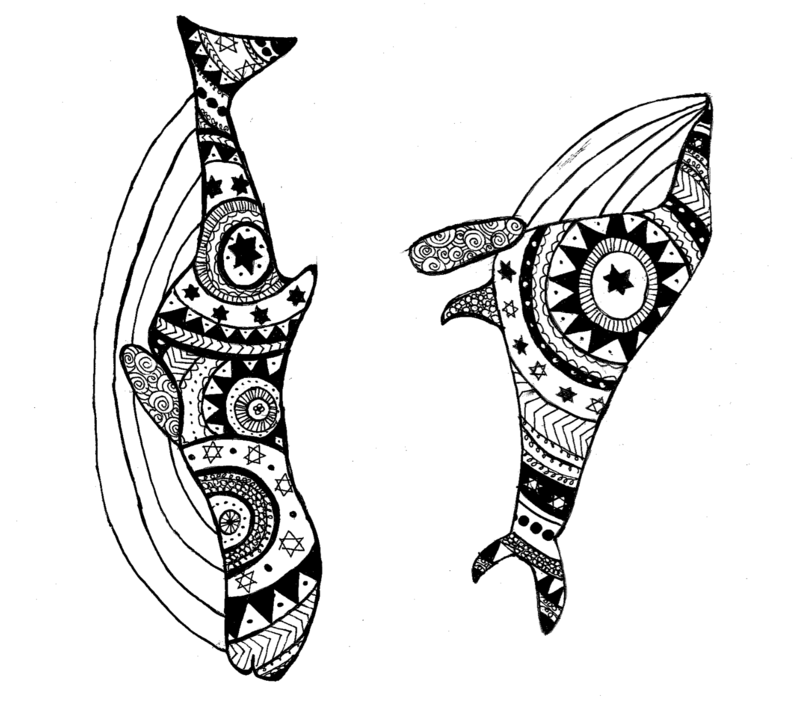 While inside the fish, Jonah repented his actions, praying for any kind of salvation. Upon being freed, Jonah immediately went to Nineveh to give the message that he was tasked with, ultimately saving the city. Admittedly, when I first read Waskow’s article, I did not exactly understand what point he was trying to make about Leviathan. After collaboration with some of my peers and really taking the time to think about why Waskow would make a reference to Jonah, I came to the conclusion that Jonah’s experience being inside the fish and the lesson that he learned was exactly what Leviathan was all about. There will be times in every person’s life in which they will come face to face with some kind of difficult or uncomfortable task. In this case specifically, it is not always easy to share new and potentially uncomfortable ideas, but sometimes it is necessary. Sometimes it is better if one can stand up and talk about things that need to be talked about, things that make people uncomfortable, or things that call for a change, for the benefit and knowledge of others. That is essentially what I have found in today’s incarnation of Leviathan. We look at issues that are relevant in the Jewish world and we talk about them and show their importance. Some issues that come up within our journals might pertain to topics that can be considered controversial or uncomfortable, and there are those who may shy away from talking about those subjects. As the current members of Leviathan, we find it our duty, however hard it might be, to open our minds and use our voices to spread the word on issues and other news that we believe is ultimately beneficial for the students of UCSC to be aware of.